Part of the stated mission of the Marine Historical Society of Detroit is the publication of scholarly works exploring the history of Great Lakes ships and shipping. Here's a list of of our current projects. Hardcover, 329 pages, profusely illustrated, 8 1/2" x 11"
An excellent historical and photographic account of the ships of the day, from the 1920s-1960s, interlaced with interesting stories of the captains and crews that manned them. This book chronicles the history of the Detroit-area based Nicholson Transit Company and its subsequent company, the Nicholson Universal Steamship Company. Founded by William (Cap) Nicholson in 1918, the company bought and sold numerous lake freighters and actively engaged in the transport of goods throughout the Great Lakes. Cap Nicholson was a true entrepreneur. Starting with a mere $500, he grew his organization into a major shipping company. This is the story of men who really were transportation pioneers on the Great Lakes at a time when computers, reliable weather forecasts, GPS navigation and autopilots did not exist. The men and ships of the day faced challenges that would seem harsh and brutal by today's standards. Yet they persevered, and with cunning and nerve, were usually successful. Emory A. Massman, Jr. was born into a maritime family, and spent much of his youth sailing with his father on Nicholson ships. During World War II, after graduation from the Merchant Marine Officer's Training School, he was 3rd mate, 2nd mate and chief mate on three different Liberty ships sailing in the Atlantic, Mediterranean and Pacific war zones. He continued his maritime career as a mate and relief captain with Belcher Oil Company, Gulf Atlantic Transportation Company and St. Philip Towing Company on off shore deep-sea tugs. He is the author of the Ships Scene, Through Massman's Lens and Hospital Ships of World War II. 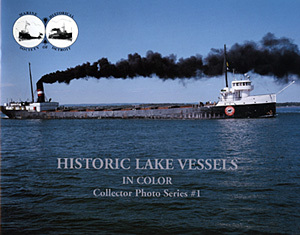 (2003) This is the first of a series of books featuring rare color photographs of ships that sailed the Great Lakes in years gone by. The book features 24 pictures, plus those shown on the front and back covers, from sources previously unpublished. The purpose of this book is to publish rare photographs for those that collect such images and to preserve the different colors that differentiate one fleet from another. The pictures, approximately 7 by 10 inches, were reproduced from slides dating from the late 1940s through the early 1960s. The rarity of these photos was a primary consideration for their selection. A brief history of each vessel is included. *Join today and receive a Savings of $7.05 off the non-member price. 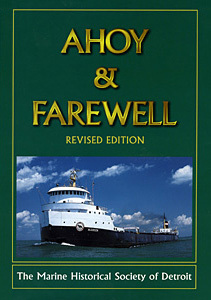 (2001) This edition, which took more than six years to produce, greatly expanded and updated information for ships included in an earlier publication of the same name (see Ahoy & Farwell 1970) and Historian supplements spanning 1944 to 1969, the Society's first 25 years. More than 700 vessels of 1,000 gross registered tons or more are included in this completely redesigned book, whereas the 1970 edition (50 pages) only covered closer to 300 vessels of similar size. This 235-page, revised and completely rewritten hardbound book offers an in-depth history of each vessel with statistics and renames, ownership changes and anecdotal information. 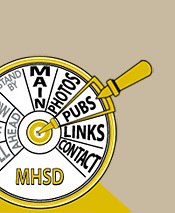 It also includes over 90 high-quality, and in many cases, very rare photographs. Post-1970 data was included in a brief format where available or referenced to Volume II. This edition includes a dust cover, an extensive index and a photo-engraved hardcover. (1996) Written to commemorate the Society's 50th anniversary (1944-1994), this greatly-expanded work covers over 440 vessels of 1,000 gross registered tons or more that came into service or left service during the 25-year period from 1969-1994. 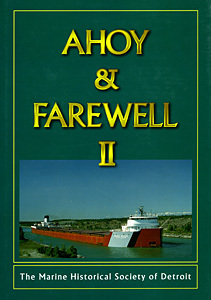 Ahoy & Farewell II offers an in-depth history of each vessel, with statistics and renames, ownership changes and anecdotal information. Hardcover, 244 pages, 65 pictures and an extensive index.